Author: E. Raymond Capt ... Understand the New Testament in a Whole New Light! This is the story of Paul the faithful Apostle of Christ his conversion and his missionary journeys throughout the mighty Roman Empire. The primary focus of this new and exciting work by Capt is on Paul's journeys from the historical and archaeological viewpoint in an attempt to reconstruct Paul's travels. This book will show how archaeology and historical research have given us a new dimension to New Testament history. It places you in the Roman world of Paul as described in the Acts of the Apostles. 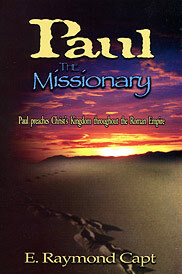 Paul's personality leaps the centuries with startling clarity as you accompany him on his missionary journeys. From the Middle East and North Africa to Spain, France, and England the mighty Rome on the banks of the Tiber held the whole known world in the grip of her power. Ruler of the world though she was Pagan Rome in the first century A.D. was already a victim of religious syncretism (the blending of different religions) that bewildering hodgepodge of divinities and religious practices which had spread throughout the Empire. This was the world of Christ and St. Paul - the political/religious background of New Testament times.